Europe’s time and battle-worn fortresses are symbols of history, beauty, chivalry and charm that allure tourists from all around the world. Castles are stunning to behold in any light, but there is a special magic witnessing them towering against a backdrop of stunning fall foliage. We’ve compiled a list of 12 of the most fascinating and beautiful castles in Germany ... you'll definitely want to add them to your list of fall travel destinations this year. Since the 11th century, various fortified structures have crowned the 2,800-foot-tall Hohenzollern mountain of the Swabian Alps. The castle was destroyed during a 15th-century siege and reconstructed as a larger, stronger fortress that survived the Thirty Years’ War but was abandoned a few years later. In the mid-1800s, Crown Prince Frederick William of Prussia commissioned the present-day Burg Hohenzollern, incorporating the 15th-century chapel in the new design. The castle remains privately owned and houses an impressive collection of Prussian gold and silver objects and artwork. Built in German medieval style in the 1840s by Count Wilhelm of Württemberg, Schloss Lichtenstein is new by European standards. 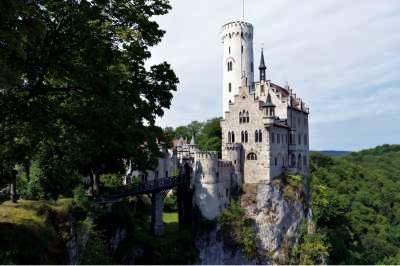 Called “Württemberg's fairy-tale castle,” Lichtenstein’s stunning architecture and scenic mountaintop location rival those of the world-famous Schloss Neuschwanstein. The castle is open weekends February to November and seven days a week from April to October. Guided tours in English are available with advance reservation. Active travelers can access nearby hiking trails and a ropes course after their castle visit. Following defeat in the war against Prussia in 1866, Bavarian ruler King Ludwig II lost his power to command troops in times of conflict. Ludwig dreamed of his own kingdom and began constructing Neuschwanstein, a structure so grand that it inspired Disney’s Cinderella and Sleeping Beauty theme park castles. Of 200 planned rooms, only 14 were completed before Ludwig’s death in 1886. Finished apartments include a two-story throne room, lavish royal bedroom, indoor cave and grand Singers’ Hall. Neuschwanstein’s spires rise among the trees of the snow-capped Bavarian Alps. For postcard-worthy photos of Neuschwanstein, venture to Marienbrücke across the Pöllat gorge and waterfall. The castle is open daily. Half-hour guided tours can be booked at the ticket office in Hohenschwangau or online. Schönburg Castle is situated on the Rhine River, above the town of Oberwesel. It was first documented in 1149, but is believed to have been built as early as 911. The original castle was burned down in 1689 during the Palatinate Wars, and remained in ruins until it was purchased In 1885 and carefully restored by a German-American banker. In 1950, the town of Oberwesel acquired the castle and has owned it ever since. In the late 1950s, the Hüttl family moved into Schönburg and opened a hotel and gourmet restaurant, as well a youth hostel. Rooms at Hotel Auf Schönburg are all-inclusive, with 4-course dinners at the restaurant, breakfast, free minibar usage, access to the castle gardens and more. Sitting high on a cliff overlooking the village of Eisenach, Wartburg Castle is considered one of Europe’s most impressive and well-preserved monuments from medieval times. Built in stages over a period of nearly 1,000 years, the castle exhibits an alluring fusion of Romanesque, Gothic, Renaissance and Historicist architecture. Legend has it, Wartburg Castle was the inspiration for the Sängerhalle at the famous Neuschwanstein Castle. Also, from 1521 to 1522, Martin Luther, the renowned theologian and leader in the Protestant Reformation, sought refuge here after his excommunication from the Late Medieval Catholic Church. It is said he used his time at Wartburg to translate the New Testament of the Bible into German. Tucked away above the lush, rolling hills of the Mosel River sits Burg Eltz. This stunning medieval castle dates back to the 12th century and has been owned by descendants of the same family for 33 generations. Located between the cities of Koblenz and Trier, it was originally built to secure the trade route between the Mosel, Maifeld and Eifel areas. Over the past 850 years, the castle has escaped the ravages of war and conflicts untouched and intact. The picturesque location of Burg Eltz is a favorite among hikers. For beginners, there is an easy 800-meter stroll. For those looking for more of a challenge, there is a 12.6-kilometer hike that provides a fantastic panoramic view of the castle. Burg Eltz is open from April through October. There are tours every 10 to 15 minutes, lasting approximately 35 to 40 minutes. Initially designed and commissioned in 1882 as a private residence, the original proprietor of Schloss Drachenburg never actually lived in it. When the ownership changed hands, this neo-Renaissance castle was developed to become a tourist attraction. 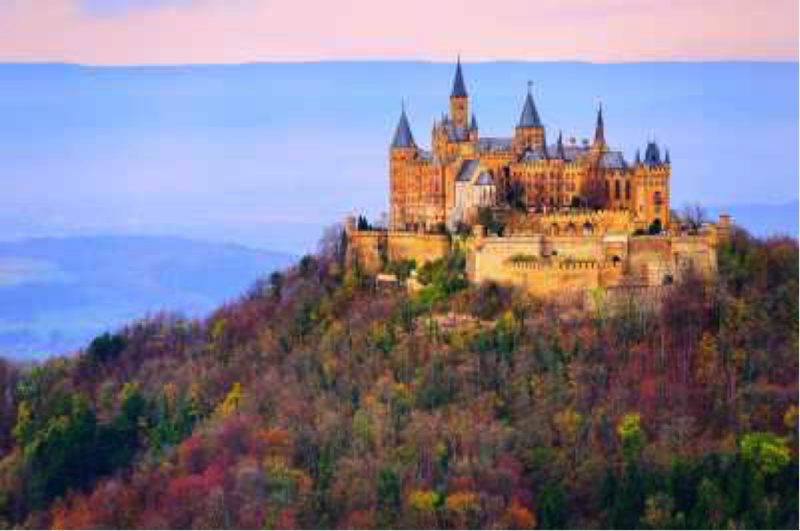 Nestled on the Drachenfels hill above the Rhine River, Schloss Drachenburg is a prime example of rising from the ashes. In WWII, the castle sustained heavy damage. Dazzling stained-glass windows and numerous works of art were destroyed, damaged or stolen. After many years of abandonment and decay, a new owner began extensive restorations in 1995. In 2011, the completely restored castle grounds were reopened to the public. Schloss Drachenburg is open seven days a week, from March to November. This millennium-old castle keeping watch over the Mosel River Valley boasts a long and colorful history. First built as a place of rest and refuge for the counts of the Palatinate, Reichsburg Cochem has seen its fair share of battles, arranged marriages and murders. When the infamous Sun King, Louis XIV, burned most of the village to the ground in 1689, its stone walls were left in ruins for close to 200 years. That is, until a wealthy businessman from Berlin, Louis Ravené, purchased the property on which to construct a luxurious summer home for his family. These days, Cochem Castle is owned and operated by the village, but it is still furnished with much of the ornate Baroque and Renaissance décor collected by the Ravené family over the years. Inside, massive stone fireplaces, bristly wild boar heads, large metal tankards and long, wooden tables give Reichsburg Cochem a quirky, yet undeniably charming medieval hunting-lodge feel. Mysterious suits of armor stand guard in one of the entryways, and a polar bear rug is sprawled across the floor of the main hall. It is important to note that you are only able to access the rooms and courtyards of the castle with a guided tour, but purchasing a ticket is definitely worth it. Tucked away in northern Rheinland-Pfalz is the impressive Schloss Bürresheim. Located approximately five kilometers from the town of Mayen, this castle was originally built in the 12th century as a medieval fortress. Over three centuries, Schloss Bürresheim was transformed from two separate buildings into the Baroque-style castle that remains. The castle is one of few in Rheinland-Pfalz that has never been conquered or damaged by conflict. Movie buffs will recognize the exterior as the fictional Castle Brunwald from “Indiana Jones and the Last Crusade.” Don’t be disappointed if the interior doesn’t match the movie; the interior scenes were shot at a different location. Schloss Bürresheim is open for tours from 9 a.m. to 6 p.m. every day from January to November (it is closed in December). Tours are in German, with an English brochure available. At first glance, the stunning Scherwiner Schloss appears to be floating gracefully in the middle of a glassy lake. Built on the grounds of a Slavic fortress constructed in 965, Friedrich Franz II commissioned the ancient castle’s renovation and reconstruction from 1845-47. Today, known as “Neuschwanstein of the North” due to its Romantic architecture, Scherwin Castle is used as a national museum, housing a collection of 17th and 18th-century Dutch paintings, arts and crafts exhibits, as well as works by Marcel Duchamp and Günther Uecker. Visitors are welcome to admire the artwork, gardens and castle grounds throughout the year. Perched in the hills above the Salzach River, along the Austrian border, is the majestic Burghausen Castle. Dating back to the 11th century, this once-mighty fortress measures just over a kilometer long and is the “world’s longest castle,” according to Guinness World Records. Built initially as the residence for the Counts of Burghausen, the castle changed hands in the 13th century and became the second residence for the Dukes of Bavaria. Recognizing the imminent threat from the Ottoman Empire in the late Middle Ages, the castle was transformed into one of the most successful defensive fortresses in Germany. Over the centuries, Burghausen Castle has remained surprisingly intact and is one of the best-preserved examples of medieval fortifications in Europe. You can stroll through six exquisite courtyards or take in sweeping panoramic views from the castle walls. The State Castle Museum offers an impressive display of artifacts, décor and artwork. There are no guided tours; visitors to the castle and museum can explore on their own. A lesser-known palace project of ill-fated King Ludwig II, Herrenchiemsee Castle is nicknamed the “Versailles of Bavaria” for good reason. Boasting its very own Hall of Mirrors, gilded walls, shimmering chandeliers, elaborate ceiling paintings and lavish fairy-tale gardens, nearly every inch of Herrenchiemsee pays tribute to the flamboyant Sun King, Louis XIV. Ludwig II acquired the property in 1873, but tragically passed away before his vision for the royal palace could be brought to life. Built on Herreninsel, an island on Chiemsee, visitors can reach the castle by boat. A fascinating museum dedicated to King Ludwig II’s unusual life story, passions and many royal residences can be found on site. No matter which castle you choose to visit - get ready for a day of enchantment!